This is the latest in a new weekly interview series. Williamson County is developing and changing at a fast pace. Like any developing area, the highs come with lows- challenges and issues that need to be addressed. Each week we interview a leader in the community, someone who is right in the thick of things, who has some kind of power over how the county- public or private sector- is facing the future. 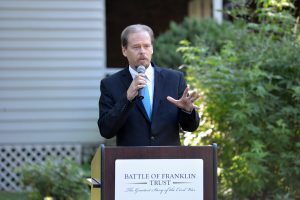 the non-profit organization in continued preservation of the Battle of Franklin grounds and the historic Carnton Plantation and The Carter House. He was previously COO for the organization and has written three books, “For Cause & For Country,” “The McGavock Confederate Cemetery” and “Baptism of Fire.” Tourism and visitor numbers at the two homes is up 35 percent in the past five years and 100 percent in the last ten years. I’ve been super busy lately working on Carter Hill Park. That has occupied about three quarters of the last month. All you have to do is drive up Columbia Avenue by Carter House to see what is going on. I have been working with the state and contractors with that and the Lowell Properties, which is the Franklin Flower shop and surrounding area, getting ready to build the park. Cutting down trees and all that. What are the parameters of the project, which is itself a part of the ongoing, years-long process of preserving the battlefield area? It has been years, and we are looking at other pieces of property already to add to it, but Carter Hill Park which will include the Carter House site, will be a 20-plus acre park, which in conjunction with the Eastern Flank Park, and with Carnton, we will have secured about 170, 180 acres of battlefield property in the last decade, and the obvious perspective is its part of the Franklin battlefield, one of the major battles of the end of the war, in the bigger context. And we are doing all this privately, and have developed this broad network of partnerships. What we are really trying to do is, not just save ground, but really try to tell the story of what happened that day, and whether people realize it or not, the Civil War worked out things that are still being worked out a century and a half later. That is the story we are telling but it is important to have ground, we had houses for a long time, but to have ground, is important. Another way to put it is, Civil War battle fields aren’t these static places where events occurred. They are places where America was transformed, America has changed fundamentally because of the war, and it started on these battlefields. This country was founded on some real basic principles, and one of them, that all men are created equal- there are people to this day that deny that the words meant literally what they meant, but they did. Of course slavery existed at the time, but the founders understood the difference between equality given to you by a creator and equality given to you by man, and those things often clashed. And ninety years later, states who thought differently chose to secede. And this union was put to the test. And ultimately what happens is the Union is preserved, slavery is destroyed, but it doesn’t take a genius to figure out that it took generations before we could get from freedom to equality. But it did more than that. America was transformed not just along racial lines, but think about women’s suffrage, and then the most important thing I think is that we stayed together as one country, and the United States of America, one country, went on to do incredible things. Today, one of the things that a lot of people want to move towards is this idea of freedom, democracy, democratic republic, whatever term you want to use, but 100, 150 years ago, no one ever talked about that. There was no such thing. This was a world filled with kings and dictators. We were it. And we almost destroyed ourselves. So when I am talking about this subject it is incredibly profound. And that is why these battlefields are so important, because that is where America could have died. And the last real light for true freedom for all people no matter where you are, could have been extinguished. I don’t know that it ever would have sparked again. So, well, preseving that moment obviously is important. But how do you balance that with the pressures of the current moment- the system that has developed in the space created by the events on the battlefields? There are places all over that preserve moments. It could be an old Woolworths in Nashville where there was a sit-in in the 1960s. It could be Revolutionary War site, an old church, but there are very few places like Franklin where real history was created. From Mack Hatcher Parkway to the Carter House, to the Harpeth River on the east side of town to West Main Street, OK, the whole thing is the battlefield. We are trying to save the real important parts of it. And this is the other aspect of it, when we got into this game 10 years ago, we realized you just have to beat the developers at their own game. You have to buy the land before they can get their hands on it. If someone wants to sell it and they set a price, and we think we can raise that price or it is worth it, we do so. We learned with the Civil War Trust years ago that you have to get connected politically. And we did that, we got the city of Franklin to understand the concept of heritage tourism, in which there is a lot of money, probably 20 to 30 million dollars a year, by our estimates, is brought into the local community from tourism. All you have to do is go to Nashville or any coastal community to see that tourism brings in money, and heritage tourists spend a lot of money. There is always that omnipresent threat of development, and you just have to be able to get in the ring and get your pieces of what you believe is worth having. We are buying up and down Columbia Avenue commercial property. We are not out in the county buying farmland. So we are pretty focused on it, but because we believe in it. Listen, it is late 1864 there are over 600,000 dead, the country is teetering on the edge of collapse. The South is falling apart, the North is sick of the war, the lives of 4 million people who are still enslaved hang in the balance, and here we are, Franklin, at the end of the war. America has always had flaws, but it is still quite a country, and we survived it. The battlefields are the place where America fulfilled its promise that all people are created equally. In the last ten years, have attitudes and awareness changed locally to historic and battlefields? How have they changed and why? Yes, and I think there are probably a couple reasons. Some of it is just time. Some of the old attitudes and denying what caused the war, denying Franklin’s importance. The newer generations understand why the county was splitting, they don’t deny the obvious. It doesn’t mean you demonize one side; it’s just the reality. The other part is an educational component. Educating adults. Kids just get it, but adults you have to get them to understand that battle wasn’t just the Carter House, it wasn’t just in this one little area. I have been doing this for over 10 years, I wrote three books about this, starting almost 20 years ago now. It takes a long time. In some ways it is generational, taking maybe 20 years to cement into the local communities the important of it. But also we have done this on a national level. Three quarters of our guests don’t live here. We have tried to elevate Franklin to a national scale. When people say the word Shiloh, Vicksburg, Gettysburg. Everyone for the most part knows that. That is what I want Franklin to be and that is what we have been doing. This isn’t just about Carter House or Carnton or Lotz or Fort Granger. It is about Franklin. That is what we have been doing just sort of slowly moving the ball bit by bit, and now we have over 100,000 people a year. We spent almost 15 million dollars preserving this battlefield and we are still doing it. So could you put the battle of Franklin in the context of the Civil War, how important is it? The Civil war is really three pieces. Beginning, middle and end. You’ve got the beginning, with Fort Sumter, and the drama of surprising Southern victories. And it builds to this this apex, Gettysburg and Vicksburg, where the tide turns to the north. But the war really drags on then for years. The middle of the Civil War is kind of like Normandy in World War II. A lot of fighting afterwards, but that was the peak. What happened in Franklin is like the end of World War II, and places like Iwo Jima. The war was not at an end until you went through these brutal, final confrontations. And places like Franklin. These great armies, in old school conventional wars in the 17th through 20th century, one army didn’t surrender until it was almost literally ground to pieces. And that is what happened to the southern army in Franklin. It’s just battered almost beyond recognition and there is just nothing left. Two weeks later the shell of it was destroyed in Nashville. So the context of it is you can’t really understand how the war ends unless you come to Franklin, Tennessee. You just can’t. You can’t go from Gettysburg to Appomattox. You have got to come to Franklin.